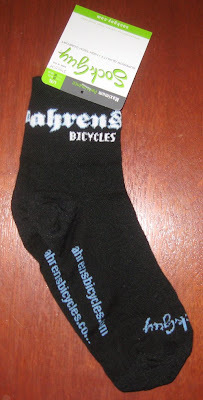 Ahrens Bicycles Blog: Ahrens Socks...Finally! I've finally received my shipment of custom Sock Guy socks! Earlier this year I worked a trade with Sock Guy for some custom WiseCracker LITE bottle openers and it's taken some time for these babies to arrive.....needless to say I'm glad they are here. Both styles are sized L/XL and they run $12 including domestic shipping. Send Pay Pal to mike at ahrensbicyles dot com if you want to place an order.